The number of Americans with Alzheimer’s disease is expected to reach 13.8 million by 2050—millions more than previously expected, according to a study published in the February issue of Neurology. Currently, the only way to know for certain whether patients have Alzheimer’s is to examine their brains during an autopsy for the presence of beta amyloid protein plaques, with elevated levels being one of the disease’s defining pathologic features. However, people with normal cognition can have elevated levels of these plaques as can people with conditions other than Alzheimer’s, the most common form of dementia. Between 60% and 80% of dementia cases are believed to be Alzheimer’s disease, according to the Alzheimer’s Association. In April 2012, the FDA approved florbetapir, a tracer marketed under the trade name Amyvid, for PET imaging of the brain to determine whether there is buildup of amyloid plaques in someone who is still living. At least three more tracers that detect these plaques in the brain in vivo are in the development pipeline. Task force cochair Satoshi Minoshima, MD, PhD, a professor and the vice chair of radiology research at the University of Washington in Seattle, says it’s not unusual for many physicians to have questions about a promising new technology like amyloid PET imaging and how best to use it. However, SNMMI had never issued appropriate use criteria before. “This is our first venture into this arena,” Fahey says. So to address the issue, SNMMI and the Alzheimer’s Association formed the Amyloid Imaging Taskforce, consisting of dementia and imaging experts from around the globe. The members met over about six months, mostly by phone, and were charged with reviewing the available scientific literature and developing consensus recommendations for the new technology’s clinical use, according to Fahey. Because the PET tracers for amyloid imaging are relatively new, the scientific literature was somewhat limited, he notes. “The task force looked at about 400 studies, narrowing it down to about 125 that were relevant,” he explains. In late January, the task force simultaneously published its recommendations online in Alzheimer’s & Dementia and the Journal of Nuclear Medicine, the flagship scientific journals for the Alzheimer’s Association and SNMMI, respectively. The task force’s recommendations include 10 patients groups, seven for which amyloid PET imaging would be inappropriate and three for which it would be appropriate. • patients with progressive dementia who are aged 65 or younger, which may indicate early onset of the disease. In these cases, Carrillo says amyloid PET imaging could help clarify or enhance a physician’s diagnosis. • patients who are asymptomatic or with a cognitive complaint but no clinical confirmation of cognitive impairment. • for nonmedical reasons, such as health insurance coverage, legal decisions, or employment screening. The task force noted that amyloid testing is not the equivalent of a clinical diagnosis of Alzheimer’s disease and is only one evaluation tool that clinicians should use to judiciously manage patients, Minoshima says. “Often, specialists in dementia can get to an accurate diagnosis of Alzheimer’s with a standard workup. Many patients don’t necessarily need an expensive test like a PET scan,” he notes. Amyloid PET testing will show the likelihood of someone developing Alzheimer’s but cannot replace the clinical diagnosis, Minoshima explains. If a patient with dementia doesn’t have amyloid buildup in his brain, then the cause of his dementia likely is something other than Alzheimer’s. That information is useful for determining additional diagnostic workup and possible treatment. “It can be particularly useful for patients when standard diagnostic workups are inconclusive,” he says. Other causes of dementia include diseases such as Parkinson’s and Huntington’s, infections, strokes, head injuries, drugs, and nutritional deficiencies. Shortly after the Amyloid Imaging Taskforce guidelines were published, the Medicare Evidence Development & Coverage Advisory Committee (MEDCAC) met to discuss whether it should recommend to the Centers for Medicare & Medicaid Services (CMS) that it pay for amyloid PET scans in any patient. Fahey says a formal decision isn’t likely until some time this summer. But at the meeting, MEDCAC indicated it likely wouldn’t recommend coverage, Carrillo says. The MEDCAC panel members indicated that they weren’t confident that PET imaging of brain amyloid changes could improve health outcomes in patients with cognitive issues. The Alzheimer’s Association published a statement on its website urging the CMS to review the evidence and recommend coverage in cases where an amyloid PET scan could help to clarify an unclear diagnosis in people who are experiencing problems with their memory and thinking that is confirmed by testing. SNMMI also issued a statement on its website urging the CMS to evaluate the evidence and provide coverage for brain amyloid imaging for the FDA-approved indication. A more definitive Alzheimer’s diagnosis could help patients and their families access appropriate treatments earlier and allow for building a care team and seeking support services, Carrillo says. It also could enable patients to enroll in Alzheimer’s/dementia clinical trials and provide an opportunity to create advance directives and do some financial planning. Amyloid imaging can cost $3,000 or more depending on location and is not yet widely available, Carrillo notes. However, she expects it to become more available as more radiopharmaceuticals win FDA approval. An amyloid PET scan differs from other brain scans and takes some expertise to interpret, Fahey says. “It takes a little getting used to what normal looks like so you can interpret what’s not normal. When the FDA approved the tracer, it recommended that the vendor provide some level of training,” he says. It is a binary, yes-or-no read, Carrillo adds, “but it can be tricky to interpret. Those gray areas could be yes and could be no.” That’s one reason the task force recommended that dementia experts be trained in reading and interpreting the results as well as radiologists. SNMMI is working with the European Association of Nuclear Medicine to draft technical guidelines on how to perform the studies. Later this year, SNMMI hopes to roll out an extensive educational program on the use of beta amyloid imaging. “We’ll provide expert opinions on how cases should be read and then offer cases that users can go through and see how they do,” Fahey says. The Alzheimer’s Association is planning an educational campaign to inform physicians when beta amyloid scans with the new radiopharmaceuticals could be potentially helpful in the workup and diagnosis of patients with cognitive impairment. Additionally, the task force noted in its report that computer-aided analysis software for amyloid imaging is under development, as are several programs available for use in the clinic. However, he adds that the bottom line, as with most guidelines, is that the healthcare provider must make the ultimate judgment regarding each patient’s care. 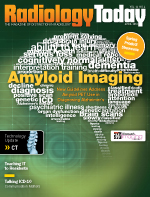 Access the amyloid imaging appropriate use criteria article through SNMMI at http://jnm.snmjournals.org/content/early/2013/01/28/jnumed.113.120618.full.pdf+html.